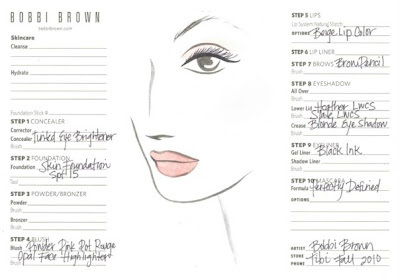 A rare glimpse into the plans of the master artist behind some of the greatest faces created for American runways: The cosmetic profiles for Fall, 2010 in the hand of Bobbi Brown. 1930'3 Egypt at Tahari. Velvety, dewy, soft naturals at Tibi. Artfully disheveled walk-of-shame faces at Rachel Roy. All documents I would love to have framed on a wall in my office someday. 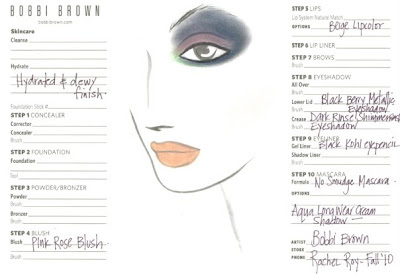 How interesting to see how the concepts translated onto the runway! And thank you for your kind comment on my page. It is very much appreciated. 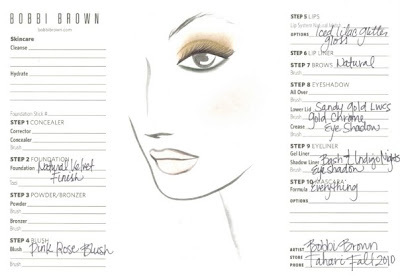 makes me want to frame my bobbi brown make-up sheet! ohhh such a neat post! i loooove it!